The church: Cathedral of St Andrew, Grand Rapids, Michigan, USA. Denomination: Roman Catholic, Diocese of Grand Rapids. The cathedral as parish church is administered by priests of the Missionary Society of St Paul the Apostle, more commonly known as Paulist Fathers. The building: It began in 1833 as a mission church and was replaced by a new church in 1850 and again in 1875. The bell of the second church was rung not only to summon the faithful to worship, but also to summon firefighters to their duties. Moved from there to the present church, the bell finally cracked in 1901 and was replaced by a peal of ten bells refurbished in 2006. 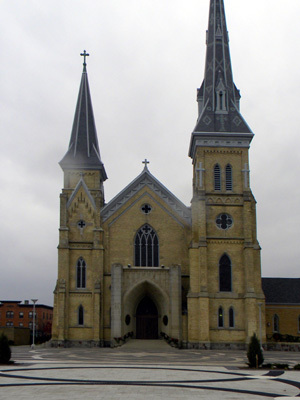 When Pope Leo XIII established the Diocese of Grand Rapids in 1882, the church became its cathedral. It was badly damaged when struck by lightning in 1901, but was restored and expanded. The present cathedral is a neo-Gothic structure seating, I would guess, about 750. Twentieth century renovations include new electrical wiring, a chapel, a new altar, enlargement of the sanctuary, and a baptismal pool, allowing for baptism by immersion. The church: The cathedral is the seat of the Bishop of Grand Rapids, but as a parish church they sponsor the typical educational activities, including sacrament preparation. As an inner city church, there is a strong emphasis on social justice issues, including a clothing center and a jail ministry. There is a strong music program, with some seven different choirs, as well as a diocesan choir. They celebrate five masses each weekend, including one that is televised locally (it is thought that the cathedral was the first Roman Catholic church in the nation to broadcast the mass each week), and one in Spanish. There are two masses each weekday. The neighborhood: Grand Rapids is located in southwestern Michigan on (as its name implies) the Grand River at the site of what used to be rapids (no longer there). It is the headquarters of several major furniture manufacturers and so is often called Furniture City. Famous sons include former president Gerald Ford; the president and his First Lady are buried on the grounds of the Gerald R. Ford Presidential Museum. There is a strong Catholic presence in this part of the city, with diocesan offices, the Catholic Information Center, Catholic Central High School, and St Mary's hospital all in the immediate vicinity. To the north of the cathedral is the Heartside neighborhood, with a significant homeless population, with several organizations (God's Kitchen, the Guiding Light Mission, Degage Ministries) serving that population also nearby. The cast: The Very Revd John Geaney, CSP, pastor, presided. Organist, pianist, and choir director was Nick Palmer, director of liturgical music at the cathedral. The date & time: First Sunday in Advent (vigil mass), Saturday, November 26, 2011, 4:30pm. About 150 were present. Keep in mind that it was the Thanksgiving holiday weekend. I was greeted by one of several ushers. He handed me a service leaflet, and, as this was the weekend that the new missal translation was being introduced, a colorful trifold with all of the congregational parts of the mass that were changing. A bit chattery; because there was an infant baptism, a number of children were present, and the child being baptized did not seem to be enjoying the service. A cantor stepped up to the microphone and announced: "Good afternoon. Mass will begin in just a moment." She then went on to explain that a new translation of the mass was going to be used, and asked the congregation to pay particular attention to the card with the new texts. There were no hymnals or missalettes in the pews; the congregation used only the service leaflet and the cue card with new texts on it. The chancel organ, one of three (gallery, chancel and chapel) installed by the Canadian firm of Orgues Létourneau Limitée, Saint-Hyacinthe, Québec. Also played were a Bösendorfer concert grand piano and a clarinet (in an arrangement for clarinet, piano, and unison voices of Bach's Wake, Awake from Cantata #140). Mostly, our soon-to-be newest member of the church just really did not want to be there. Well, I'd say "or what"  a formal novus ordo liturgy with some informal moments. Although this was the day for introducing the new missal translation, it was also a day on which a baptism was being held, and so there was some confusion as to which parts should be said and which could be omitted. Father Geaney noted the omissions but added, "We did just get through the first prayer, and we're all still here." And at the end of the service, after not being able to find the blessing in the new missal, he said, "Let's just do it the old way." Music was eclectic: everything from a plainsong hymn, to choir anthems by Bach and Distler, and the Grammy-Award-winning gospel singer Andrae Crouch's "Soon and Very Soon." 8  Father Geaney is an accomplished speaker. He spoke without notes and walked among the congregation as he spoke. He noted that people who survive a heart attack or cancer often have a new focus; life takes on new meaning. It is important to be watchful and careful about the things we do, and about our relationship to God. Advent is not just about being more aware of our sins, but also about being more aware of the many gifts we have from God. The new translation of the mass. I especially liked the invitation to communion: "Blessed are they" rather than "Happy are they" followed by the restored quote from Matthew: "Lord, I am not worthy that you should come under my roof." Although not fully tested, with several parts of the usual mass liturgy omitted due to the baptism, the congregation generally acquitted themselves fairly well. Nick Palmer is a fine organist, with good improvisational and accompaniment skills. Well, the new translation of the mass. "Chalice" in the eucharistic prayer rather than "cup" just, to my ears, grates. And there was an odd pause in the baptism service, immediately after the baptism. The child to be baptized had been unclothed and then immersed in the baptismal pool three times. Then his mother took him to another room to be dressed in his baptismal gown, which took a few minutes; after an awkward silence, Father Geaney said (presumably to Mr Palmer), "You might want to sing that hymn." We were rewarded with a fine performance of Hugo Distler's heavenly setting of "Lo, How A Rose." Nothing. The congregation filed out fairly quickly. 7  I am not likely to make this my regular church, as I am not Roman Catholic. But my wife is, and she would approve of the strong commitment to social justice. The music program seems to be excellent. How long it takes to undress an infant so he can be immersed.